Calling all green ladies out there...WISE Women is a new network I have formed to bring together women who are working in, are concerned about and want to do more about sustainability and the environment. Please come join us. Our first Speaker Event tackles one of the most pressing issues of our day: Peak Oil. We know it's running out, we know it's soon, but how do we make sense of it all and why is our government failing to address our pending energy crisis? 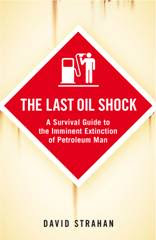 David Strahan, award-winning investigative journalist, documentary film-maker and author of The Last Oil Shock will unravel these and other issues surrounding the imminent extinction of Petroleum Man + Woman.